Posted on Sunday, January 18th, 2009 at 10:36 pm. The oyster omelette, more commonly known amongst us Taiwanese as 蚵仔煎 pronounced “oh-ah-tzen,” has always been my favorite snack. My boyfriend, who is Japanese and Korean never had the honors of trying this luscious treat, full of crisp bok-choi and yummy oysters embedded in a chewy omelette. The best part is the red sauce smeared on top, the finishing touch, and also the most difficult part to master for aspiring chefs. We went to a cramped restaurant in Chinatown called Taiwan Cafe to try their oyster omelettes. I figured if any place in Boston would serve the snack, it would be this one. I was right, and seconds later we had a plate of steaming hot omelette in front of us to share. It was bliss. Images of eating the omelette on many a day while I was in Taiwan flashed through my mind as we devoured the delicious omelette. Have I had better ones than Taiwan Cafe served? Of course. This one was on the greasy side. However, it was the best I could get, and I was having it. My boyfriend was so enchanted by the omelette that he decided to make it himself. After about 2 tries, I think he’s developed a pretty decent recipe, right down to the mysterious sauce. 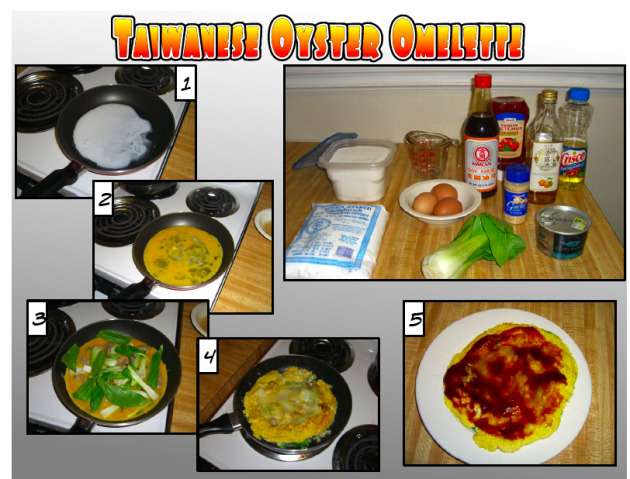 For all you Taiwanese oyster omelette lovers out there, I have decided to share my boyfriend’s recipe for making the omelette at home. Enjoy! Mix all of the ingredients together. Add more sugar for your own sweetness. 1. Wash and thinly slice the bok-choi. Then cut the sliced pieces in half, making them about an inch thick. Set the bok-choi aside. *You can use other green vegetables in place of the bok-choi. 2. Crack the eggs and mix them into a bowl. Add a little bit of salt, pepper, and garlic powder to give the eggs some flavor. Set aside. 3. Mix the water and tapioca starch together. Set aside. 4. Heat 2 cooking pans and add about 3 tablespoons of vegetable oil on both pans, medium heat. 6. Once the starch turns transparent, add in the egg mix. Gently stir the pan with a pair of chopsticks for 10 seconds. 7. Add the oysters and bok-choi to the eggs. Let them cook for about 4 minutes over medium heat. 8. After the egg mix hardens, flip the omelette from pan A to pan B (the other pan). 9. When the omelette is done cooking, place it on a plate. 10. Spread the Omelette Sauce over the Oyster Omelette. thanks for sharing your recipe! i don’t think i’ve ever had bok choy in the omelette before… have you tried using A-tsai instead?